You might detect I am saying this with tongue firmly in cheek. The summer in upstate New York has been dry and hot. Water flow through the gorges around the Finger Lakes is very low. 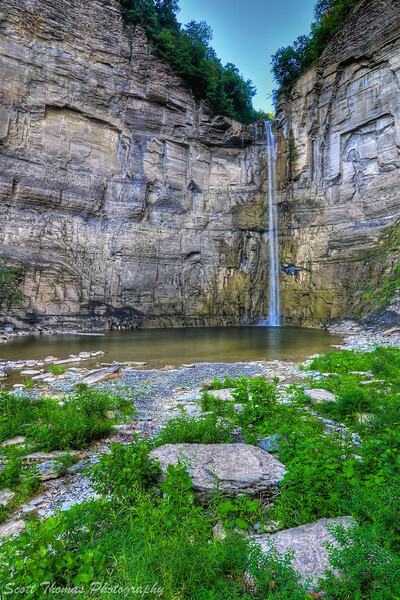 Even Taughannock Falls has very little water falling over the 215 foot (65 meters) drop. Summer water flow over the Taughannock Falls near Ithaca, New York. Nikon D700/Tokina 11-16mm, f/16, ISO 200, EV 0, 16mm focal length, tripod, HDR Image. What a difference from the last time I was there back in May, eh? I was joined last weekend by two Ithaca area bloggers, Barbara of The Aspiring Photographer and Debbie of My Life in CNY, who meet me early in the morning at the Taughannock Falls State Park. We all had a good time getting to know each other better while photographing the beauty of the park. Thanks, ladies, and I hope we’ll meet up again so you can show me more of the Ithaca area. 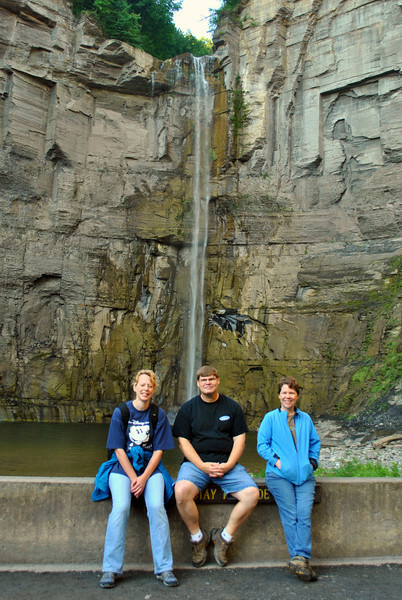 Bloggers Debbie of My Life in CNY, Scott of Views Infinitum and Barbara of The Aspiring Photographer at Taughannock Falls State Park near Ithaca, New York. Photo by Debbie. Nikon D3000, 1/50s, f/4.5, ISO 100, EV 0, 24mm, tripod, remote shutter. This entry was posted in Nature, Weekly View and tagged gorge, hdr, landscape, new york, nikon D700, photomatix, pool, rock, season, state park, summer, taughannock falls, tokina 11-16mm, tripod, uwa, wall, water, waterfall, wide angle. Bookmark the permalink. Even a waterfall needs to take a break now and then. 🙂 Thanks, Simone! The water will be flowing again once we get a few days of rain in the area. So much difference in the waterfall and yet these Falls are beautiful in every Season. Just looked at your previous pictures. Each one of them has its own charm. Great pictures, Scott. It was a fun time to meet up with Barbara and Debbie. They both used Taughannock Falls State Park for the last assignment on Scale. Hard not to keep going back to such a natural wonder. Sounds like a great time was had by all, Scott. Oh by the way; thanks for the link love! You’re most welcome, Larry. Us, NY Bloggers, got to keep in touch. Still a beautiful location this waterfall although there is not so much more water now. And Barbaras and Debbie blogs I had not visited before, interesting to see your various posts about the trip. It is a beautiful location. The rocks and gorge is so very impressive to walk through. Maybe I should spotlight more blogs in my blogroll in the future. Always looking for a guest post if anyone is interested. I think it’s a fine waterfall. At least it is higer than what we find here in Denmark. It would be nice to have the sound from the location with the picture. This waterfall is higher than Niagara Falls but no where near the capacity. I remember that post, Carsten. You guys should do it again. How fun that you got to meet up with fellow bloggers. No, we do not know what a Texas hot and dry is like. We’ve gotten a lot of rain since this photo was taken. I hope you get a break in the weather soon and that it doesn’t take a hurricane to do it. We need to plan a big blogger meet someday.